“A Gateway to Hope,” by E.C. Jackson, is an inspirational romance with an engaging plot and a message of moving forward when faced with challenges. The story follows the optimistic, introverted 21-year-old Neka and 29-year-old James Copley; two people from very different backgrounds. When James’ fiancée leaves him the day she’s supposed to meet the family, James is in a predicament because his dad requires him to marry for him to continue to be involved with the family business. Neka steps into the picture, and the two, each with their unique personality, force each other to face issues they had been avoiding, while opening new doors at the same time. Jackson has a knack for writing in a way that deals with real problems while still being optimistic and uplifting. The romance plot is paced well, with plenty of ups and downs, and Neka and James have great chemistry. 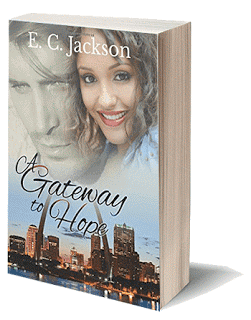 If you’re looking for an inspirational romance, I'd highly recommend “A Gateway to Hope" to you!